Utilizing nutritional labels on food products can be frustrating because they are difficult to understand, and apply to your specialized renal diet. Learning how to understand nutritional labels on food products can be very helpful in balancing your diet and making it easier to comply with your treatment plan. In order to reduce the time you spend deciphering the nutritional facts on food labels, KidneyBuzz.com has provided you a list of essential nutrients and their recommended values. Cholesterol: The American Heart Association recommends limiting intake of cholesterol to 300 milligrams or less daily. Potassium: Food with more than 200 milligrams per serving is considered high in potassium. Sodium: If your serving of food is greater than 300 milligrams then it is considered to be high in sodium. Phosphorus: Foods that are high in phosphorus will have a serving size in excess of 160 milligrams. Total carbohydrate - The recommended allowance of daily carbohydrates is 130 grams. Protein: Daily intake of protein is dependent on whether you are on a high protein diet, or low protein diet. However, the average recommended daily consumption of protein is about 56 grams for men and 46 grams for women. Trans Fat - It is advised to consume as little trans fats as possible. 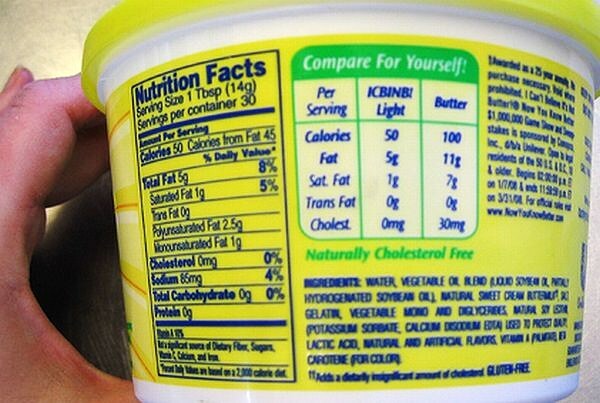 The ideal amount of trans fats are in fact 0 grams per day. Often times this is not possible, so KidneyBuzz.com recommends that you limit your intake of this fat as much as possible. Saturated Fat - It is advisable to limit your saturated fat to 20 grams or less per day. Total Fat: This is a combination of trans, polyunsaturated, monounsaturated, and saturated fats. Note that companies are compelled to list trans fat and saturated fat on labels, and total fat should account for 20-30% of your total caloric intake. Unfortunately, if you have CKD or are on dialysis, the drawback to food labeling is that it is optional for manufacturers to display the amount of potassium and phosphorus contents, and these are among the most important dietary concerns you have. If you have a question regarding one of those minerals, ask your dietitian or call the manufacturer directly, whose number is listed on the product label. Also, a lot of fast food restaurants will give you nutritional information about their meals upon your request. For further information about nutritional label updates, you can contact the Food and Drug Administration at: 1-888-Info-FDA (1-888-463-6332). Additionally, you can download many apps for your smartphone or other devices which make it easier to track your food intake throughout the day, and to use real-time data to make decisions about your kidney diet. "Kidney Dialysis Food Lists - Nephrology Physicians, LLC." Kidney Dialysis Food Lists - Nephrology Physicians, LLC. "Diet & Nutrition: Reading Food Labels." Kidney Options. Is Vegetable Oil Healthy for those with Chronic Kidney Disease, as Conventional Wisdom Suggests?